이남기 교수와 성우경 교수 연구실은 공동 연구 결과 (김철희, 이오철 박사, 김재열 박사 주도), D-shaped DNA 나노 구조를 제작하였고, 이를 이용하여 DNA가 bending tension에 대응하는 구조적 역학을 단일 분자 수준에서 측정하였다. 그 결과 DNA가 가운데 부분에 bubble을 형성하며 단번에 꺾이는 구조와 그 동안 이론적으로 예측되었던 DNA 끝 부분이 풀리는 “fork”를 형성하는 구조의 두 가지 형태를 갖게 됨을 처음으로 규명하였다. 이 결과는 2015년 6월 5일 응용 화학 및 생물리 분야의 권위지인 Angewantde Chemie 에 온라인 발표 되었다. 특히, 본 내용은 상위 5% 내의 중요한 연구 결과로 인정 받아 VIP paper에 선정되었다. Bending with high curvature is one of the major mechanical properties of double-stranded DNA (dsDNA) that is essential for its biological functions. The emergence of a kink arising from local melting in the middle of dsDNA has been suggested as a mechanism of releasing the energy cost of bending. 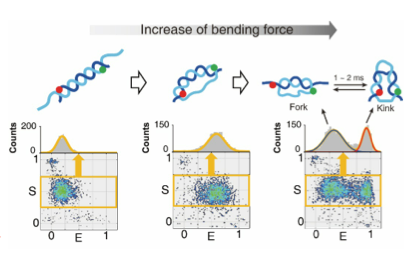 Herein, we report that strong bending induces two types of short dsDNA deformations, induced by two types of local melting, namely, a kink in the middle and forks at the ends, which we demonstrate using D-shaped DNA nanostructures. The two types of deformed dsDNA structures dynamically interconvert on a millisecond timescale. The transition from a fork to a kink is dominated by entropic contribution (anti-Arrhenius behavior), while the transition from a kink to a fork is dominated by enthalpic contributions. The presence of mismatches in dsDNA accelerates kink formation, and the transition from a kink to a fork is removed when the mismatch size is three base pairs.